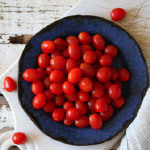 The classic round is a big round tomato and is considered a staple in Southern Africa. The average weight of the classic rounds varies between 70g and 150g, and generally measure about 50mm to 70mm in diameter. All the varieties in this class are known as LSL (long shelf life). No genetically modified (GM) produce is cultivated. Classic rounds are versatile, have a wide range of uses and have an excellent shelf life. Due to its size, this tomato is ideal for sandwiches and hamburgers. Tasty sheba is almost always a winner! Classic rounds are an economical choice when preparing tomato or pasta sauce, or making tomato juice. This variety is harvested in a truss, similar to grapes, with the vine still intact; the fruit is not removed from the shoot. 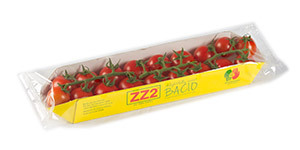 ZZ2’s vine tomato varieties are known as Bacio and Faco. They are round in shape, brilliant red (Bacio) and golden yellow (Favo) in colour and have traditional sweet tomato flavours. The Bacio and Favo’s soft skin make it excellent for frying, in salads or as a sensational snack between meals. It is popular among those who like to get creative in the kitchen. Pop it in the oven for a roasted side dish with a sweet and tangy taste. 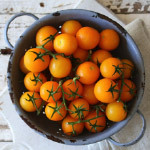 Mini or plum tomatoes come in a variety of colours that vary from deep red (Romanita and Santé), brown, pink (Medley Mix), to brilliant yellow (Yellow Drop). They have an oval shape and dramatically differ in size; from small to medium-small. 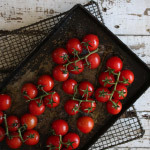 Plum tomatoes are versatile and can be used in a variety of ways. It is best used fresh in a salad or as a healthy snack between meals. 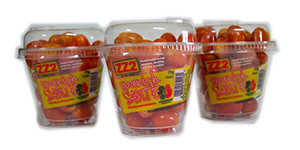 ZZ2’s classic round tomatoes are the largest of ZZ2’s tomato lines and remain the core of sales countrywide. The classic round is especially popular with traders in the informal sector due to its excellent shelf life of the varieties that are cultivated. 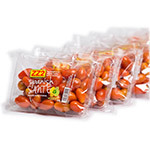 Packaging of the classic round tomatoes are planned and executed to fulfil the needs of consumers in the various market segments and quality of the produce. The well-known tomato bag is available in 750g (left), 1kg and 2kg (right). 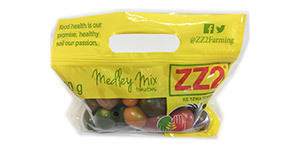 These bags are available in supermarkets and in bulk (ZZ2 carry boxes) on the national fresh produce markets. The traditional six pack, known as Z6, is packed in a polystyrene tray and wrapped with plastic cling sheets. Although it is one of ZZ2’s more traditional lines, it still is very popular among consumers. 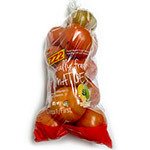 The tomatoes are protected against bruising due to the lack of movement in the packet. 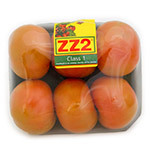 The Z6 is available in supermarkets and in bulk on national fresh produce markets. 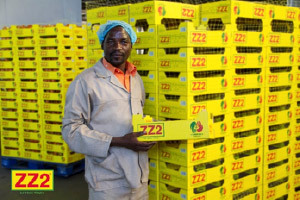 The bright yellow boxes in which ZZ2’s classic round tomatoes are packed, have become a South African icon. They are durable and consumers re-use them as storage and traders in the informal sector as shop counters amongst other things. Three sizes are available: 3kg -, 6kg – and 9kg. The boxes are only available on fresh produce markets where it is bought in bulk by supermarkets and independent traders and resold to their customers. 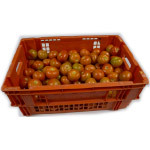 Loose tomatoes are sold on national fresh produce markets in 20kg crates. This is the most economical way to buy ZZ2’s classic rounds as it is not packaged. It is especially popular with street traders and consumers buying their produce on informal markets. The crate is used to transport the produce and is not part of the sale. 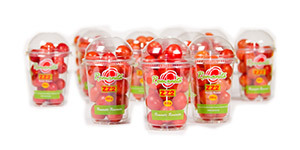 Romanita is a plum or mini tomato and is available in a 500g bag and a 250g snack cup. 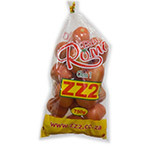 This extremely popular variety are readily available in leading supermarkets and independent grocers countrywide and in bulk on the national fresh produce markets, where the bags are sold in yellow ZZ2 carry boxes with 16 bags of Romanita or 11 snack cups. Romanita means “spirit of Rome”. 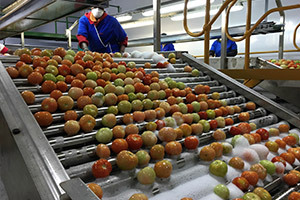 The daily demand for Romanita varies between 25 – 30 tonnes per day. 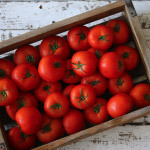 Although this tomato has a multitude of uses, it is mainly used fresh in salads. It also enhances the deep red colour of sauces. Spanish Santé is a mini plum tomato, but sweeter and smaller than the Romanita. Santé is available in 200g punnets and 175g snack cups. It is available at supermarkets countrywide and on the national fresh produce markets as a packed product. Santé is the French word for health. Bacio is a small vine tomato with a dark red colour, hence the name Bacio, meaning “kiss” in French. Bacio is available in boat tray packaging of 350g. The boat tray packaging protects the tomatoes from damage and bruising. 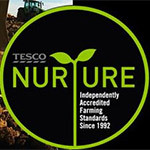 It is readily available at most leading supermarkets and retailers and in bulk on the fresh produce markets. 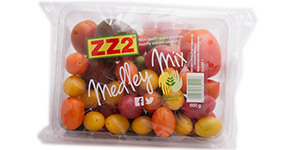 Medley Mix is the latest addition to our tomato range. This innovative packaging offers five mini and plum tomato varieties that were selected to highlight their differences in colour and size, but complement each other in taste from sweet to tangy. It makes for interesting, colourful and fun salads. Medley Mix is packed in a punnet of 600g and a carry bag of 600g. It is available at leading supermarkets and independent retailers countrywide and in bulk on fresh produce markets. 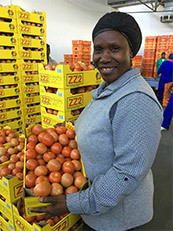 One of ZZ2’s unique characteristics is the ability to deliver significant volumes of produce throughout the year. 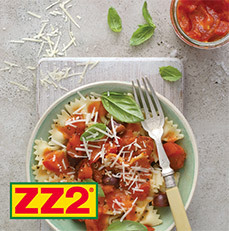 Due to this continuity in production, ZZ2 has become a preferred supplier of tomatoes to supermarkets and fresh produce markets. Consumers and traders on South African markets are assured that there will always be produce available, thus contributing to food security. 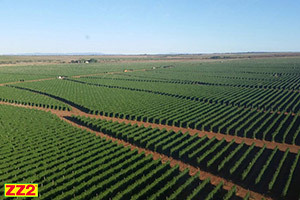 Consist of open field production and 90 ha net house or protected cultivation. 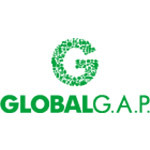 Selection of cultivars according to quality, adaptability, reliability, resistance to diseases, intended market and season. Optimal drip irrigation and engineered contouring contribute to optimal yields per hectare. Cultivation of tomatoes excel in temperatures between 20ºC and 24ºC. 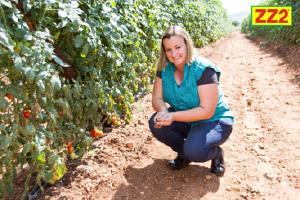 The cooler climate of the Highveld in summer is well suited for tomato production. 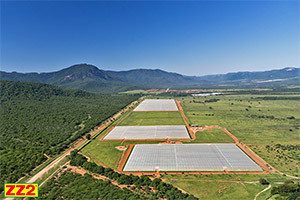 The Polokwane area covers open field production as well as nethouse and greenhouse cultivation. 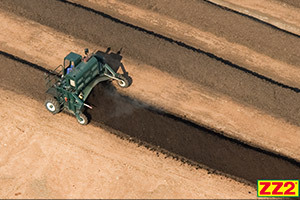 Fields are rested for at least five years before it is planted again. Rotation cultivation ultimately contributes to a resistance to diseases and soil health. This frost-free area is situated north of the Soutpansberg in the Limpopo province. Two of these areas are situated on the Limpopo river. 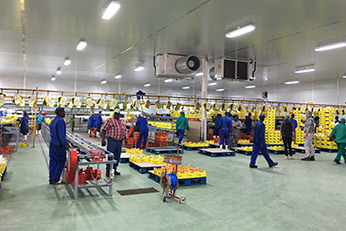 On EsméFour the necessary infrastructure was created to handle the large volumes in winter; such as a modern packhouse with cooling facillities to ensure fresh produce is delivered to the markets. Another packhouse is situated in the Waterpoort area near Louis Trichardt. 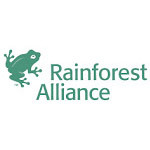 Consists of open field and protected production areas. Tomatoes are cultivated within a six-month window, from seed until the fruit is available on the supermarket shelf. 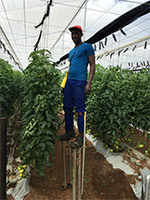 Most of our tomatoes are cultivated on open fields but ZZ2 is progressively implementing protected farming methods such as nethouses and greenhouses. Due to the intensive nature of tomato cultivation and the volumes that need to be produced, open field production remains at the core of ZZ2’s tomato cultivation. Our five-year rotational planting policy means that our tomatoes are cultivated in rested and healthy soil. We put back what we take out. These practices are all in line with Natuurboerdery® protocols of farming on a large scale without damage to the environment. Protected farming offers numerous benefits. 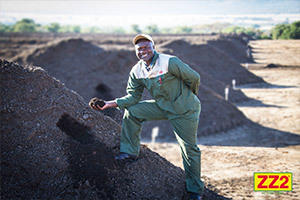 ZZ2 is progressively switching to, and implementing, greenhouse and nethouse methods to improve yields and produce large volumes without reverting to industrial farming. It offers an ideal environment to do research on plant protection, contol of diseases through nature-friendly practices and plant nutrition. 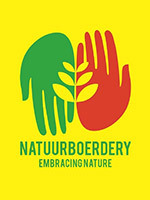 ZZ2’s way of farming are called Natuurboerdery®. 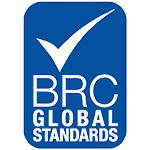 It is a registered trademark that guarantees the consumer that the produce on our farms are produced according to certain health and ethical standards. 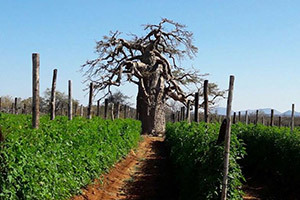 Agricultural practices and processes founded in Natuurboerdery® are aimed at using the best technology in harmony with the laws of living nature, of which the most important are probably efficiency and adaptable sustainability. It can also be described as moving away from “hard” industrialised farming concepts by including more sensible concepts of organic farming. 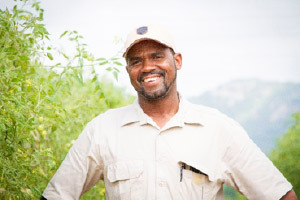 Natuurboerdery®-based farming principles encompass more than agricultural practices – they also govern our entire association with our natural environment. 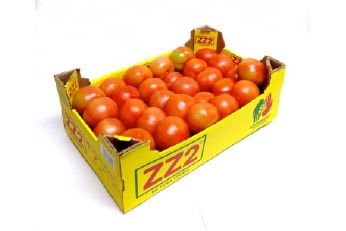 ZZ2 has six tomato packhouses situated in the Limpopo province. We have more than 70 tomato packing lines. Packhouses operate on a seasonal basis depending on the area of production. This means that our tomatoes travel a short distance from field to packhouse after harvesting. This practice prevents bruising of the fruit and offers consumers a fresh product in the shortest possible time from field to consumer. Great care is taken during the harvesting process. 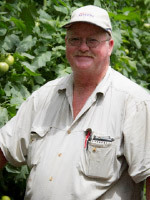 Tomatoes are hand-picked and land assistants are trained not to damage the fruit. 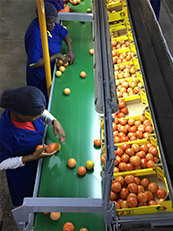 Fruit with defects are removed from the production line during the early stages of packaging. 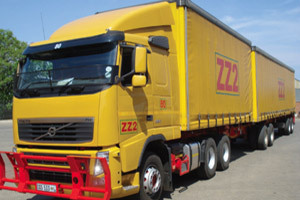 ZZ2 has a fleet of trucks that transports produce to supermarkets and national fresh produce markets daily. 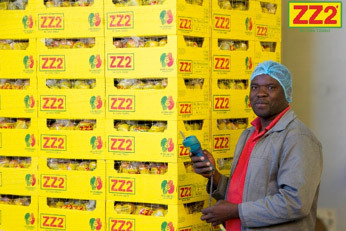 The reliability and prompt delivery of produce through a well organised distribution network has contributed to ZZ2’s reputation as a supplier of fresh produce of good quality that is delivered on time. ZZ2’s packhouses are able to customize packing processes and procedures to fulfil clients’ needs. Supermarkets adjust their orders re variety, volume and packaging daily. We process, pack and deliver these orders in the shortest amount of time possible. 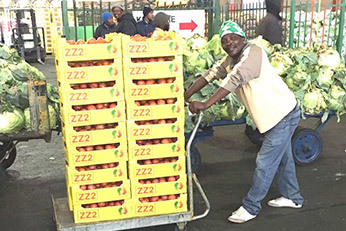 To achieve this, ZZ2 has a well-established system that includes specialised facilities and equipment to pack and deliver large volumes of produce in line with clients’ needs. The quick removal of field heat after harvesting is key to a long shelf life. Within hours of being picked, tomatoes are delivered to packhouses where the produce goes through a process of forced cooling. This slows down ripening. The tomatoes are kept in this cooled environment until the consumer can buy the product from the supermarket shelf. 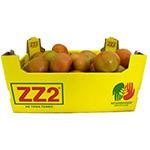 Years of experience and research has enabled ZZ2 to produce the best varieties with long shelf life characteristics. No genetically modified (GM) produce is cultivated. 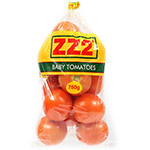 How and what determine ZZ2’s tomato prices? ZZ2 is a grower and producer of food. 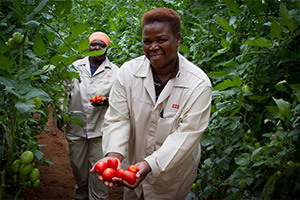 Once our tomatoes leave the farms, they go directly to fresh produce markets countrywide where the price is determined through the market forces of supply and demand. This process is managed by independent professional sales teams (agents) not employed by ZZ2 and operates on an ad valorem commission basis. Through this system, ZZ2 creates empowerment opportunities. 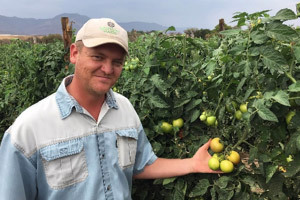 No tomatoes are sold directly from ZZ2’s farms.